MR. BIG gathered in a Los Angeles studio and in a matter of six days recorded their new album DEFYING GRAVITY, their ninth original studio album and the starting point for a new worldwide tour. Here’s our thoughts on the album (which you can also get by checking out the Bard’s Corner Music News podcast or by checking out the Bards Corner Music News on YouTube). The bands original members are all present and correct on this album: Eric Martin (lead vocals), Paul Gilbert (guitars), Billy Sheehan (bass) and Pat Torpey (drums) are reunited with producer Kevin Elson (who was behind the boards for the bands 1989 self-titled debut, 1991s “Lean Into it” and 1993s “Bump Ahead”) for an intensive six-day recording session in Los Angeles. As many are aware, drummer Pat Torpey was diagnosed with Parkinson’s disease and was thus unable to perform on some of the songs on “Defying Gravity”, so Matt Starr fills in for him on a majority of the album. Starr is hardly a newcomer to the group though, as he has also been touring with the band for the past couple of years, with Pat Torpey able to play a couple of songs at each stop. I usually worry when i hear that a band has recorded an album in such a short time, as that sometimes means that the creative process has been rushed. But it’s certainly not the case here, rather I’d say it’s the result of the professionalism and chemistry of the band themselves that made it possible. My personal highlights on this album are “1992”, “Nothing At All”, “Damn I’m In Love Again”, “Nothin Bad Bout Feeling Good”. The album boasts a good rhythm throughout. It also at times has a bluesy feel, something that really suits the voice of singer Eric Martin, as well as the play style of bassist Billy Sheehan. Verdict: 7/10. I enjoyed listening to this album, I’ve heard it several times now and will certainly listen to it again. If you are a Mr. Big or Eric Martin fan then you certainly won’t want to miss this. If not (and why not?) but you like modern bluesy rock, then check this out. “2017 is filling up quickly with tour dates all around the world,” proclaims Gilbert. “I can’t wait to play the new songs, and of course our favorites from the old days like ‘Daddy, Brother, Lover, Little Boy’, ‘Just Take My Heart’, ‘Green Tinted Sixties Mind’, ‘Wild World’, and ‘To Be With You’. 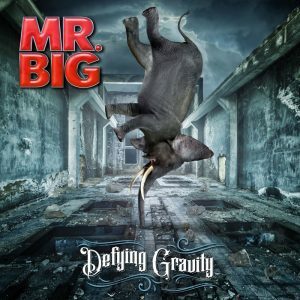 Mr. Big’s album “Defying Gravity” was released on the 21st of July via Frontiers Music SRL.